The extent of the utility you’ll get out of most hook backed patches is the ability to make someone laugh or serve as a marker or identification. The Superesse Straps Note Patch Kit can do both of those things and then some! 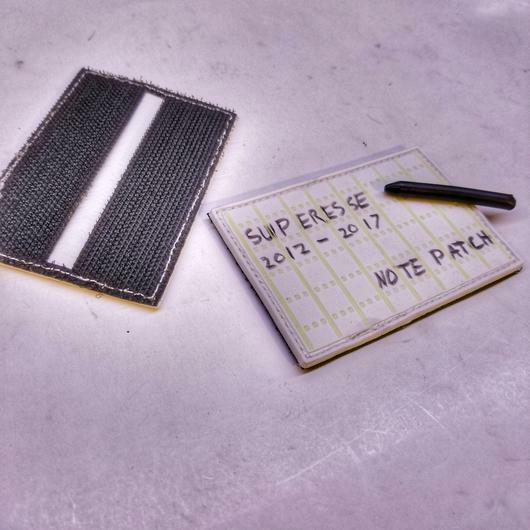 Like Superesse Straps’ other “Patch Kits”, the Note Patch Kit has a hidden compartment behind the patch itself that is accessed via a slit in the hook material. This is good for storing things discreetly or just for the convenience of carrying something like a small dry erase marker or charcoal pencil… which you can use to actually write on the surface of the patch. The surface of the patch is white with glow-in-the-dark memo lines and can be written on. The kit comes with a number of items including the patch, a charcoal pencil, kneaded eraser, and ranger bands (which can be used to erase), and a lead pencil. It is also available with an optional Parapen (ink pen wrapped with paracord) and note sheets.